1.) Chris Christie’s banner year of unprecedented popularity ends with a reelection landslide. Since Hurricane Sandy struck New Jersey in October 2012, Gov. 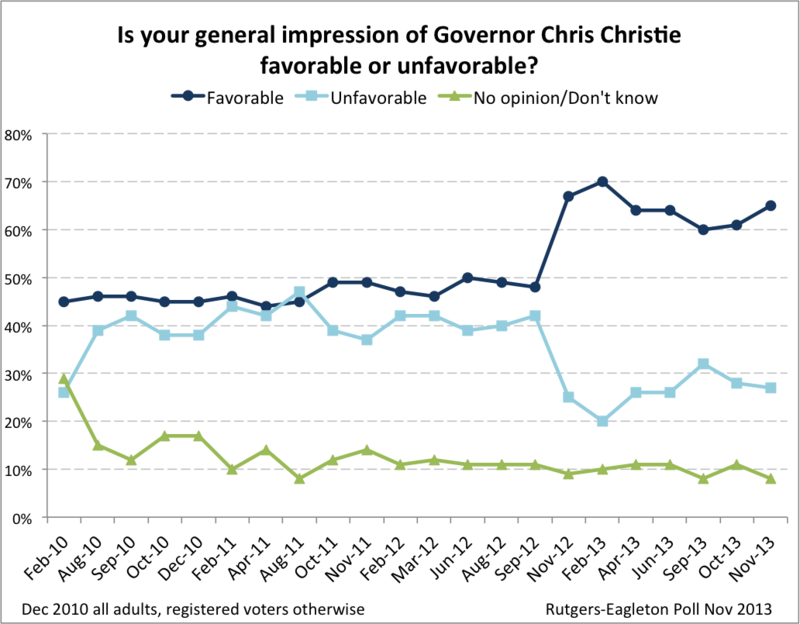 Christie’s ratings have seen unprecedented highs throughout 2013, ending the year with 65 percent of voters having a favorable impression toward him, 68 percent approving of the job he is doing, and 59 percent awarding him an A or B as governor. Christie – following his own administration’s motto – has certainly been stronger since the storm, with his widely acclaimed Sandy leadership and resulting personal popularity driving his reelection victory over Democratic State Sen. Barbara Buono in this past November’s gubernatorial election. The governor easily won a second term by double-digits on Election Day against his virtually unknown, unsupported, and under-funded opponent – after a campaign year that continually showed little contest and increasingly good news from Christie, who received unparalleled support from across the political aisle, independents, women, and minority voters. Christie has become a media darling and front-page news both state and nationwide, and a 2016 presidential bid seems all but inevitable as early polling shoes him to be a top contender. The governor’s Sandy-driven success has all come in spite of New Jerseyans’ lower ratings of Christie on key issues that they deem most important in the state – 44 percent of NJ voters still disapproved of Christie’s handling of the economy and 50 percent disapproved of his job on taxes when last polled in November. Only time will tell how long the rally around Christie will last as he enters his second term and as the national spotlight placed on him continues to grow brighter. And that’s it for our Top 5 for 2013. There were plenty of other stories over the year, and lots of additional polling. But these are the ones we think stand out. All the best for a Happy New Year from the Rutgers-Eagleton Poll! I wrote an article on my blog about Christie for 2016. Check it and other articles out on my blog here: http://wp.me/46pNX. Thanks!